Here are my answers to the bidding questions in my Christmas Competition, although I accepted anything that was sensible. If South deals, I suggest one club - one diamond - one heart - three spades (splinter bid) - four diamonds (the hand is slam-suitable, and showing the ace or king in partner's first-bid suit is important) - four no-trump, ending in six hearts. When North is the dealer, see the diagram. Yes, Roman Key Card Blackwood would be good to confirm that the heart queen is missing. You hold the North hand. (a) South opens one diamond. What would you bid? One heart. (b) South rebids one spade. (i) What would you do now? Two clubs, fourth suit game-forcing. (ii) How do you envision the auction continuing? You will support diamonds, then look for a slam. You hold the North hand. South opens one club. What would you respond? One diamond -- look for a fit in all three of your suits. You hold the West hand. With neither side vulnerable, East opens one spade and South passes. What would you respond? Two spades -- or a sporting four spades! You hold the East hand. 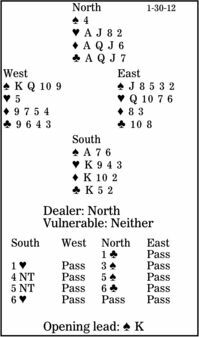 With neither side vulnerable, West opens two spades, showing a decent six-card suit and 5 to 9 high-card points. After North passes, what would you do? Anything but pass. Four spades, four no-trump, three no-trump, five spades, six spades; let your imagination roam.